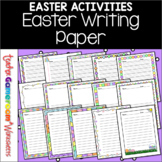 This Easter lined paper would be great for students to write about what they did, or are going to do, on Easter. 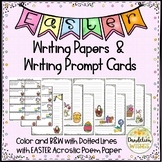 Enjoy these neat Easter themed creative writing prompts and Easter themed paper. 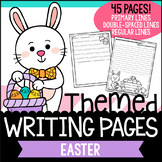 You will receive 18 writing prompt pages and more than 10 blank (lined) Easter themed template pages. 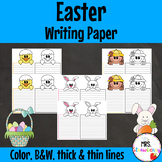 You and your students will love it!! 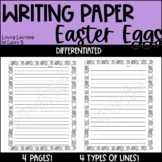 This lined paper has a picture of a chicken hatching from an egg. 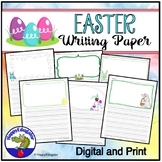 It would be great for writing a story, writing about spring, writing informative text about hatching eggs or writing about their Easter. 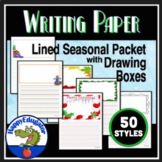 The Teacher Vault TPT store also has this available with intermediate lines for older students. 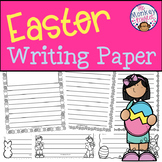 22 Easter borders, perfect for printing and writing letters and Easter Story activities. 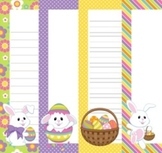 Two copies of each border, one lined, one un-lined. Just print and use. 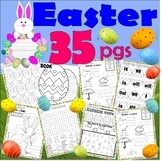 Not clear images, these are just for printing off and using in your class.